When Rough Justice disbanded in July 1979, a disappointed Rick Bryant moped around for the rest of the year, undecided as to his next move. In March 1980 he was invited to front an Auckland group already well into rehearsal. The group consisted of leader and pianist John Malloy, bassist Alistair Dougal, guitarist Gary Langsford and drummer Michael Polglase. With a doctor, law graduate and a former university lecturer in the line-up, what else could they call them selves but Top Scientists. They were a new experience for Bryant. Dominated by songwriter Malloy, they were a high energy outfit with little need for Rick's R&B preferences. He seemed quite prepared to settle into a minor role, focal point but not leader.. Exceptionally tight, the Top Scientists were never really accorded the attention they deserved, and just when things were looking bright Bryant left. Shortly after he teamed up with Sam Ford in Neighbours. Gary Langsford was to later appear in a version of DD Smash. The Neighbours had its origins back in late 1978 when Sam Ford formed the Sam Ford Verandah Band. It was a loose-knit Ponsonby outfit which got together for weekend jam sessions on Ford's verandah. Throughout 1979 the group built up a fan brigade with gigs at the Gluepot, later hitting outback districts where their brand of country rock was well received. A covers band with the odd Ford composition thrown in, the group's focal point was vocalist Trudi Green. 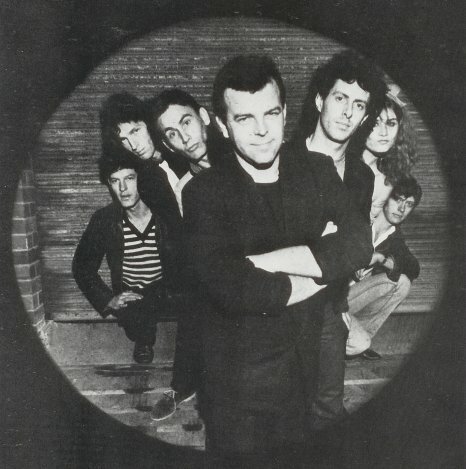 In 1980, the group having gone through numerous personnel, changed their name to Local Heroes, and it was when that band called it a day in March 1981 that Rick Bryant came along. The original line-up featured Rick Bryant, Sam Ford and Trudi Green, plus Ken James and Poss Cameron from Local Heroes, and Andrew Clouston and Paul Kunac. The Neighbours was very much a touring band, visiting every corner of New Zealand over the next three years. The touring was not without a cost as there were frequent personnel changes along the way. Some of those to pass through the ranks included Wayne Baird (Guitar), Mike Croft (Saxophone), Phil Toms (Bass Guitar), Tim Robinson (Drums), and Chris Green (Saxophone). Only Bryant, Green, Ford and James made it through the entire journey. Despite the country-rock origins of the bands nucleus, it was as a raunchy R&B outfit that the Neighbours staked their claim. They started by conquering the small towns and slowly took on the larger cities where they were also successful. It was two years before they returned to Auckland and packed out the Gluepot once more. But once again, just as they were starting to become financially strong, Rick's attention was starting to turn to other things. On the recording side, the Neighbours released two singles. The first in 1981 "Love Is Never Cruel"/"All My Dreams" and the second "Watching Westerns"/"Hand In Hand" in 1982. They released a 12" EP in 1982 called "The Only One You Need" and in 1983 an album called "Vocal At The Local", recorded live at the Gluepot. None of them were huge sellers, and all featured the vocals of Trudi Green. Rick was not perturbed, but however, in mid 1983 he decided to form a separate band to showcase his version of the soul experience. He formed Rick Bryant and the Jive Bombers. For more on Rick Bryant see the following groups, Original Sin, Gutbucket, Mammal, and Blerta and Rough Justice.